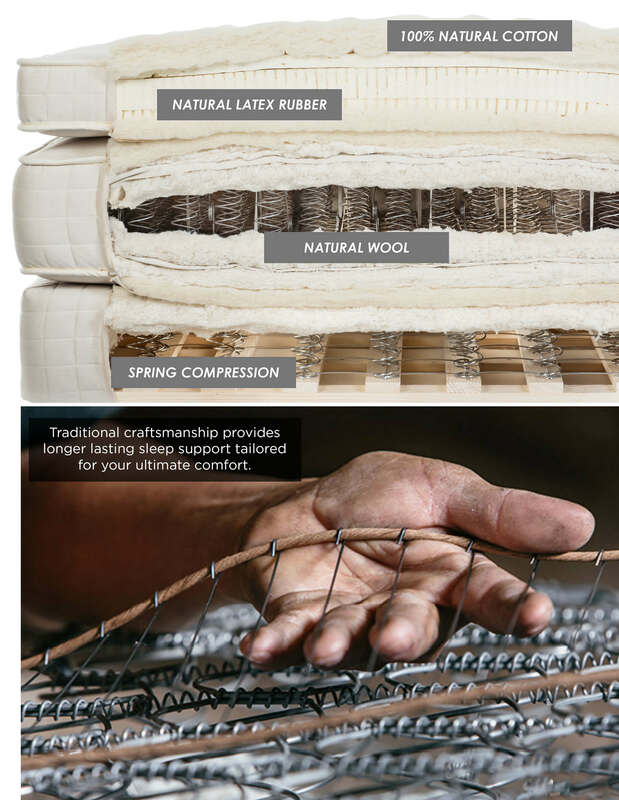 It’s actually very simple: we use only the world’s finest materials to provide you the most restful sleep ever -- materials that you never have to worry about for many reasons. For example, our hand-tufted cotton is from sustainable sources, biodegradable and eco-friendly. Our latex rubber is tapped directly from the tree and is toxic-free and naturally hypoallergenic. Our chemical-free, Joma-technique New Zealand wool stays soft and bouncy year after year. And our reinforced coils made from American-mined minerals are designed to adjust ergonomically to your body’s curves. In other words, your ultimate comfort and peace of mind is our #1 mission. We also offer certified organic materials upon request, not to mention being able to create custom sizes and shapes -- and we can embroider names, wedding and anniversary dates and business logos on our mattresses. © 2017 ULTRAKING™ a division of Custom Comfort Mattress, Inc.